The 2019 FMEHS program will take place during the 2019 PMEA/NAfME Eastern Division Conference in Pittsburgh, April 3 (report date for FMEHS participants) – 6. Thank you to everyone who submitted applications! The Window of Opportunity to submit has closed at this time. For – Pennsylvania High School Seniors who have been accepted at a college or university to major in music education. 12-16 students will be chosen from the applications submitted. Purpose – To present a series of experiences within these students’ chosen career path, in a professional setting. Students will be making connections with their future peers and mentors, creating a support system for their career preparation, and having opportunities to discuss and reflect on all aspects of their future careers with college music education majors and professional educators. 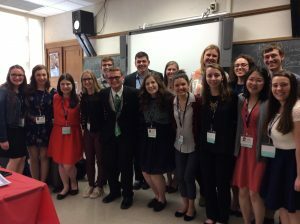 When – Running concurrently with the 2019 PMEA/NAfME Eastern Division In-service Conference, ending with attendance at the All-State Concerts on Saturday, April 6. Chaperoned housing overnight in Pittsburgh. Cost – $385. To be paid by sponsoring school district, or booster group, or possible scholarship from student’s TRI-M chapter or PMEA District, or individual family. A student accepted for this program, with his/her sponsoring HS director/PMEA member’s help and advice, is responsible for payment of fee. Evidence of acceptance into a college program for music education, letters of recommendation, personal statement, copy of grades, cumulative average and class rank, and sponsorship by his/her PMEA HS director are required in the online application. Conflict of Opportunity – If a student chosen for this program also qualifies for an All-State performing ensemble, he/she will have the opportunity to choose which program to accept. Congratulations to all the students who participated in the 2018 FMEHS!